130,000-235,000 Btuh Gas Input Heating Cap. 119,000 Btuh Heat Pump Heating Cap. 25,600-204,800 Btuh Opt. Electric Heat Cap. safety standards for servicing required by U.L., C.S.A. economizer control, 0 to 100% outdoor air, adjustable minimum position. Filter Size: 16 x 25 x 1 in. protect outdoor coil. Not used with Hail Guards. evaporator air; minimum external duct static pressure. NOTE - Net capacity includes evaporator blower motor heat deduction. Gross capacity does not include evporator blower motor heat deduction. 2Integrated Part Load Value rated at 80oF (27oC) outdoor air temperature. 3Sound Rating Number rated in accordance with test conditions included in ARI Standard 270. Tube diameter - in. (mm) & No. Drain connection no. & size - in. in accordance with ARI Standard 210/240 and certified to ARI. Cooling Ratings - 95oF (35oC) outdoor air temperature and 80oF (27oC) db/67oF (19oC) wb entering indoor coil air. High Temperature Heating Ratings - 47oF (8oC) db/43oF (6oC) wb outdoor air temperature and 70oF (21oC) entering indoor coil air. Low Temperature Heating Ratings - 17oF (-8oC) db/15oF (-9oC) wb outdoor air temperature and 70oF (21oC) entering indoor coil air. NOTE - ARI capacity is net and includes indoor blower motor heat deduction. Gross capacity does not include indoor blower motor heat deduction. 2Integrated Part Load Value rated at 80ºF (27ºC) outdoor air temperature. NOTE - This is the only permissible derate for these units. Gas Manifold Pressure - in. w.g. LTB2 Electric Heat Terminal Block - LTB2-175 (30K75) 175 amps. *NOTE - All 460v and 575v unit voltages use LTB2-175 (30K75) terminal block. *Refer to National or Candian Electrical Code manual to determine wire, fuse and disconnect size requirements. NOTE - Extremes of operating range are plus and minus 10% of line voltage. NOTE - Where current does not exceed 100 amp, HACR type circuit breaker may be used in place of fuse (U.S. only). *Refer to National or Canadian Electrical Code manual to determine wire, fuse and disconnect size requirements. Use wires suitable for at least 167ºF (75ºC). **May be used with two stage control. NOTE-Fuse block must be ordered extra. Fuse block must be installed in unit with field installed heaters. Also requires LTB2 Terminal Block. heaters. Also requires LTB2 Terminal Block. NOTE - Fuse block must be ordered extra. Fuse block must be installed in unit with field installed heaters. Also requires LTB2 Terminal Block. Total Heating Comp. Total Heating Comp. Total Heating Comp. Total Heating Comp. Total Heating Comp. Note - Heating capacities include the effect of defrost cycles in the temperature range where they occur. *Outdoor temperature at 70% relative humidity. Indoor temperature at 70 oF (21oC). Blower table includes resistance for LCA102 Base Unit only with dry indoor coil and air filters in place. Then determine from blower table blower motor output and drive required. See page 27 for wet coil and option/accessory air resistance data and blower motors and drives. LCA102 models require 3000 cfm (1415 L/s) minimum air with electric heat. 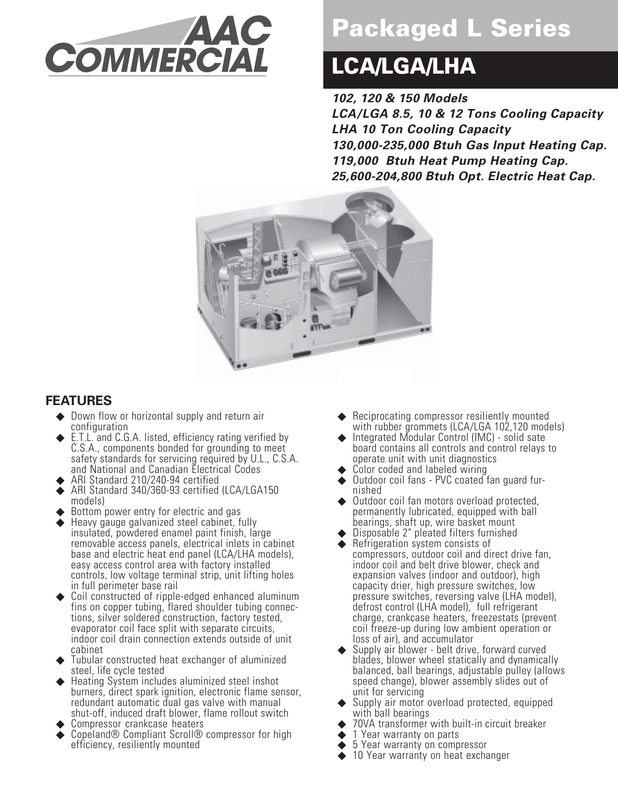 LCA120 & 150 models require 4000 cfm (1225 L/s) minimum air with electric heat. used, be sure to keep within the service factor limitations outlined on the motor nameplate. the outlet or diffuser before the maximum velocity is reduced to 50 ft.
(15 m) per minute. Four sides open. require optional horizontal conversion kit. listing. All wiring shall be in compliance with NEC and CEC. staging control and combusiton air proving switch on induced draft blower. charge. All models shall have low ambient operation down to 0oF (-17.7oC). 340/360-93 (LCA/LGA) and ARI Standard 240-96 (LHA). minimize sound. Openings shall be provided for power connection entry. Indoor coil condensate drain extended outside cabinet shall be provided. wheel shall be statically and dynamically balanced. protected. Fan shall have a safety guard. element. Limit controls shall provide overload and short circuit protection. mounting frame, to provide duct connections to the diffuser. Coil Guards - Furnish and install galvanized steel coil guards. complete with recirculated air dampers, outside air dampers and controls. enthalpy setpoint and DIP switches for setting type of control log used. outdoor enthalpy and differential enthalpy (outdoor and return air). metal. Economizer shall be available for field installation. prevent blow-back and outdoor air infiltration during off cycle. dampers shall be available for field installation in the return air duct. shall be available to provide outdoor air requirements of up to 25%. shall exhaust air through optional gravity exhaust damper (required). economizer and gravity exhaust dampers. conditioned air. Flashing shall be the responsibility of the roofing contractor. Frame shall be approved by U.S. National Roofing Contractors Association. Service Outlets - Furnish and factory install dual 115 volt, 15 amp GFCI type service outlets. Wiring shall be field provided. Smoke Detectors - Furnish and field install photoelectric type smoke detector in either or both return air section and supply air section. Terminal Block (LCA/LHA Models) - Shall be required for units without disconnect switch but with single point power supply and electric heat. Unit Fuse Block (LCA/LHA Models) - Shall be required for units with single point power supply and electric heat. Base Unit - The standard unit with NO OPTIONS.